SSL Certificates are fundamental to internet security. They are used to establish an encrypted connection and allow data to be transmitted securely between a browser or user's computer and a server or website. Standard SSL (Domain Validated) Certificates are the easiest and most common type of SSL certificate. OV and EV Certificates also authenticate the identity of the company or organization that holds the certificate providing more trust to end users. Establish trust and online security for your website visitors and business. Google wants to make the web safer and a big part of that involves making sure that the sites people access via Google are secure. That's why websites using SSL have been shown to benefit from higher ranking in search results. Web pages not served via HTTPS are now being displayed as ‘not secure’ in Google Chrome and Mozilla Firefox. Don't let your website be one of them. Add SSL today. While all SSL certificates use similar methods to protect and validate your data, the level of trust and assertion they provide varies. Extended Validation Certificates offer the highest level of validation and trust. They validate and display the name of the company or organisation along with the green address bar which is one of the most highly recognizable trust indicators on the web. Secure your domain and all same level subdomains fast. GeoTrust QuickSSL Premium Wildcard certificates are one of the quickest ways to start protecting all your subdomains on a single certificate. 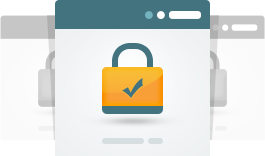 Our automated email authentication process means you get your certificate in minutes. With QuickSSL Premium wildcard certificates, you get unlimited subdomains and on an unlimited number of servers - one certificate that will adapt as your business grows. SSL Certificates enable data encryption on the internet and allow data to be transmitted securely from a web server to a browser. With SSL, your website can use the https protocol and will display a padlock in end users web browsers to indicate the connection is secure. Why do I need an SSL Certificate? SSL Certificates are an essential part of the internet. They not only encrypt communication between your computer and the server where a website is located, but they also provide verification that a site is what it claims to be. What are the different types of SSL? There are 3 different levels of vetting that SSL Certificates are based upon. Domain Validated (DV) , Organization Validated (OV), and Extended Validation (EV). The major difference between the types of certificate relates to the information the Certificate Authority, RapidSSL, GeoTrust and Symantec, requires and validates in order to issue a certificate. The higher levels of certificate require more information, and often is displayed in the browser bar. EV SSL for example turns the browser bar green and displays the organization name to visitors to generate more trust. What if I already have an SSL Certificate? Our SSL certificates are from some of the most trusted brands in Online Security. Copyright © 2019 Hostify.co.za. All Rights Reserved.